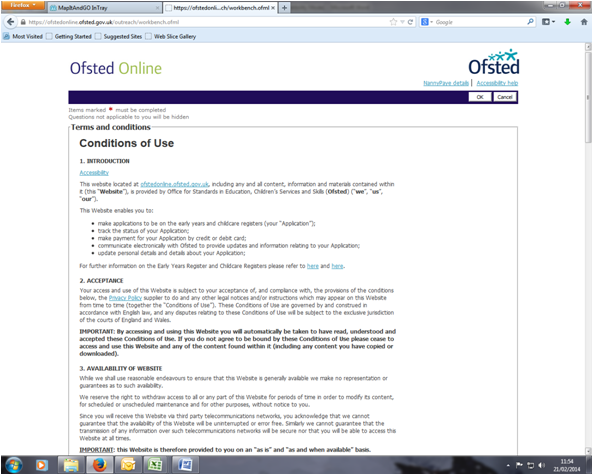 To start the Ofsted Registration process a DBS check on the DBS Update Service is required. 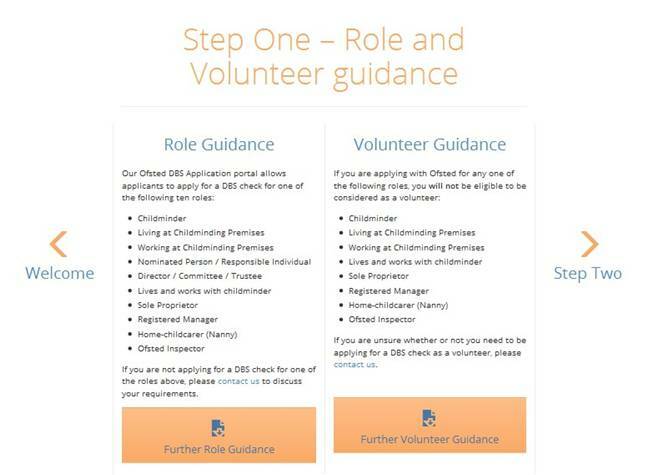 Ofsted will accept a recent DBS check from a nanny agency if you have joined the DBS Update Service. If you are unsure if you have the DBS Update Service active, you will have a Service ID and can check your DBS update subscription status online at https://secure.crbonline.gov.uk/crsc/subscriber. If you have lost your Service ID you should contact the DBS Update Helpline on 03000 200 190. 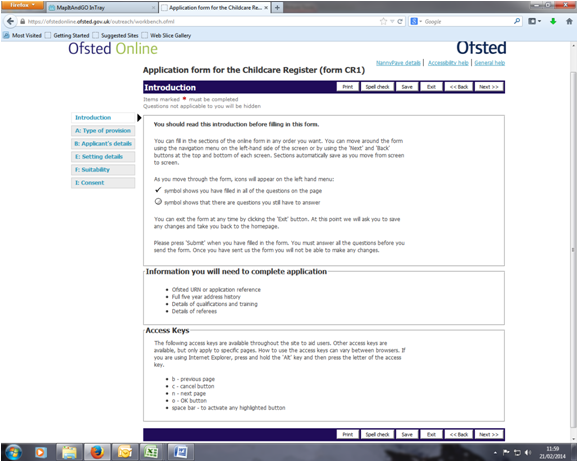 Applying for a DBS check is a requirement for new applications for the Ofsted Childcare Register. Since September 2014 the requirement is that all applicants must have a DBS check which is on the Update Service. 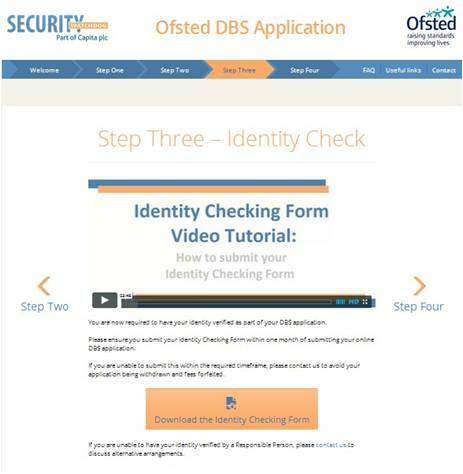 Complete the DBS check application form online. 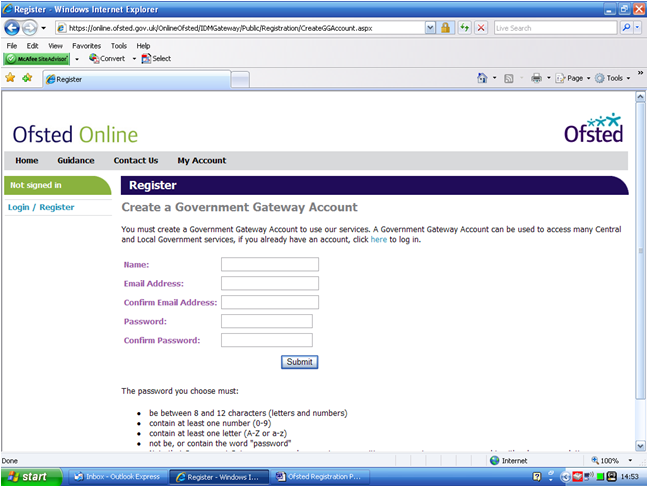 Pay online – a payment receipt is sent via email. 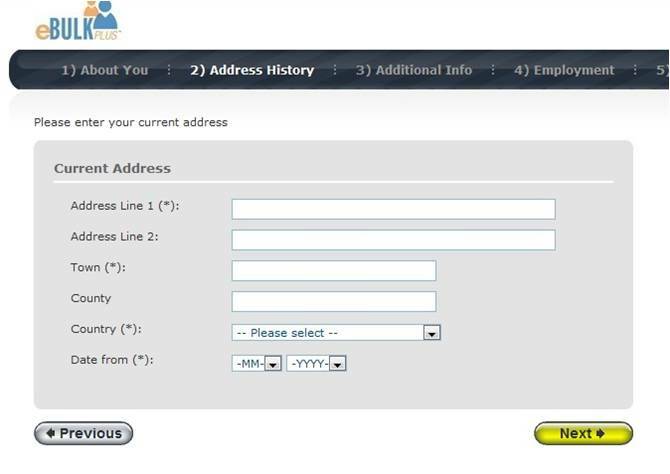 An e-mail is sent with an Application Reference, which must be written on to the ID Check form. Print out an ID check form and have a suitable person (the form includes a list of suitable occupations) to check your nanny’s ID. Scan and e-mail the ID check form to Security Watchdog. An e-mail is sent stating that the application has been sent to the DBS. This contains a DBS Application Form Reference. 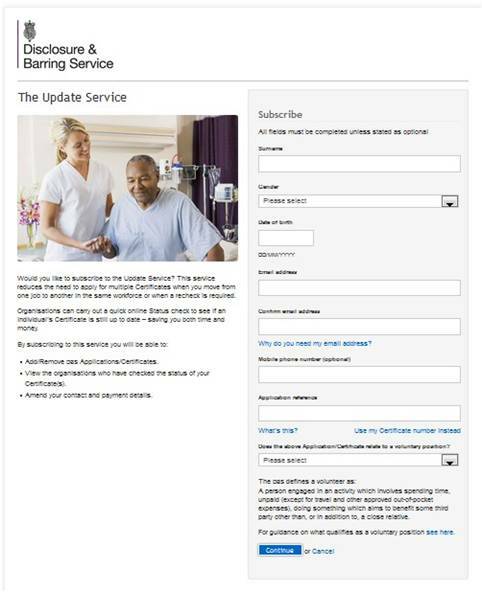 Subscribe to the DBS Update service using the DBS Application Form Reference. Wait for the DBS Certificate to arrive. This can take a few weeks to many months. Your nanny is NOT a volunteer, they are a paid employee. 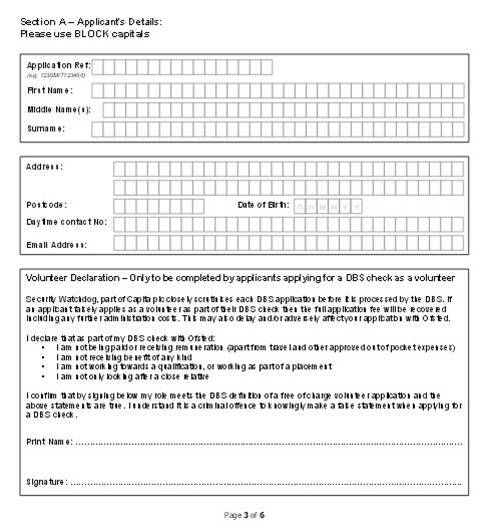 Later on the ID Check Form the volunteer section must be left uncompleted. Watch the video. 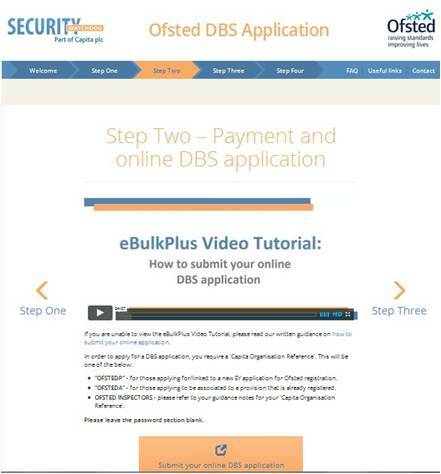 Note that the code to use is OFSTEDP and click on Submit your online DBS application. Organisation Reference is OFSTEDP and leave the Password field empty. Click Enter to continue. 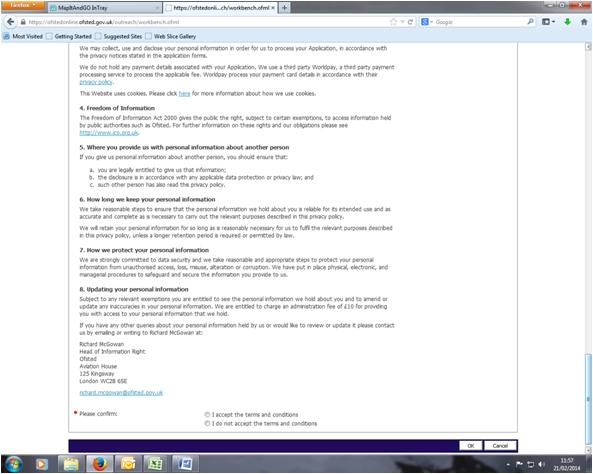 Read the Statement of Fair Processing and at the bottom tick the two boxes, then click Next. Read the next page and at the bottom tick to confirm that payment will be required. Then click Next. This page is for details about your nanny. It can be useful to refer to how your nanny's name appears on their driving license, passport and other identity documents. Complete your nanny’s contact details – phone and e-mail address. Then click Next. This page is for your nanny’s home address. If your nanny lives with you then this would be the same as your home address. 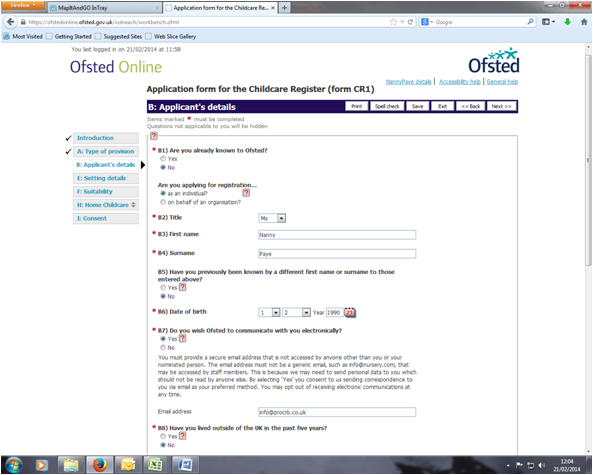 It is useful at this stage to keep a note of the address and dates entered, as these will be needed for the Ofsted registration form and must match with those entered at this stage. There cannot be any gaps or overlaps in the address history. Please ensure that the month and year from a previous address are repeated as the same date at the start of your next address. Enter the nanny’s current address and click Next. The next page will let you add additional addresses. There must be 5 years worth of previous address history. 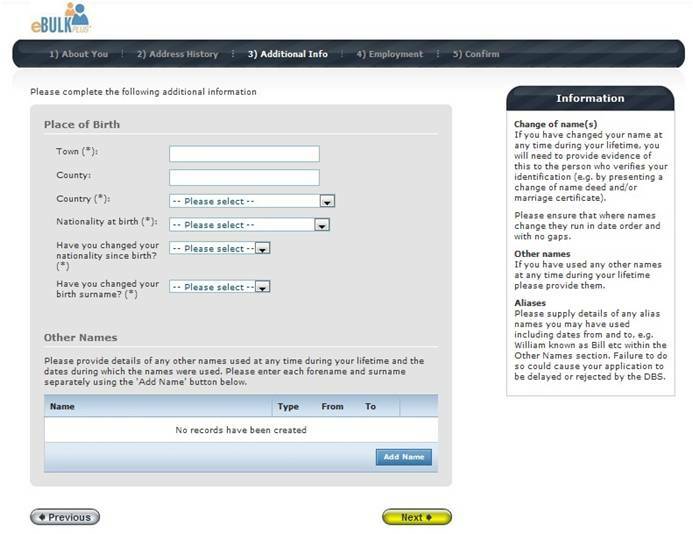 Complete your nanny’s Place of Birth details. Refer to Birth Certificate. If their surname has changed since birth, such as due to marriage, then complete details. Then click Next. 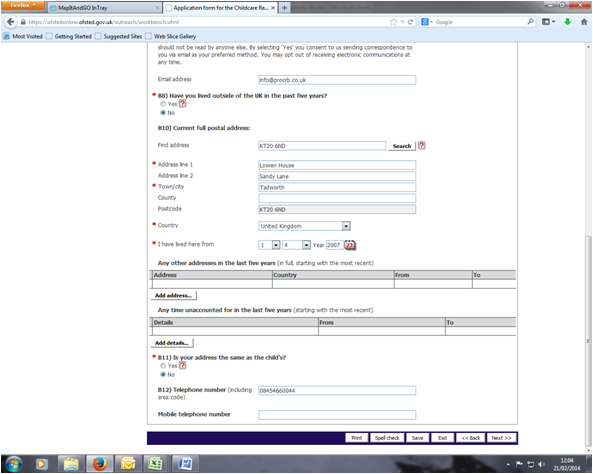 Then select Yes/No regarding convictions and click Next. 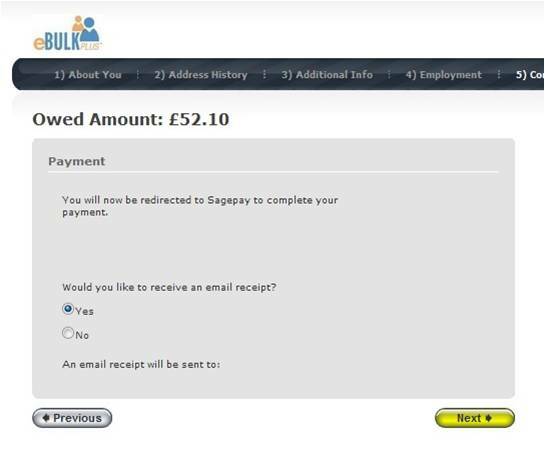 Payment amount will now be confirmed and click Next to proceed to entering card details. 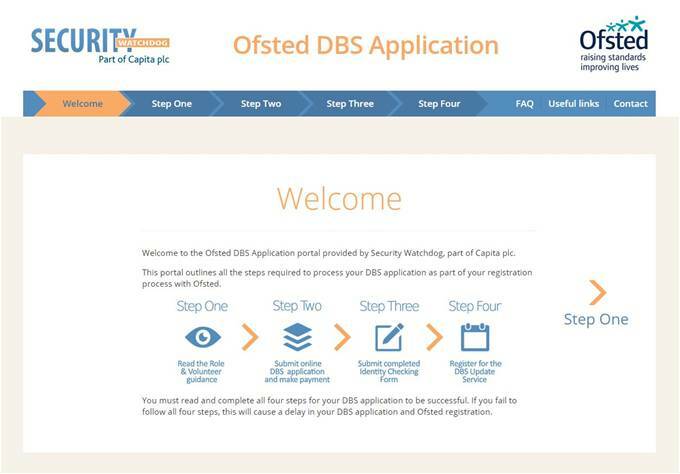 Once DBS application is completed, go to Step 3 on www.ofsteddbsapplication.co.uk. Print out the ID form. When completing the ID form it is very important that it is completed in BLOCK CAPITALS and in BLACK PEN. This makes the form easier for scanning and processing electronically. Volunteer Declaration section must no be completed. Capita/Security Watchdog on 0114 2413 284 opt 1. Once the ID form has been completed, send just pages 3,4 and 5 to the address given on the form by Recorded Delivery or scan and e-mail to the e-mail address given on the form. Sending by e-mail is suggested for avoiding delays. 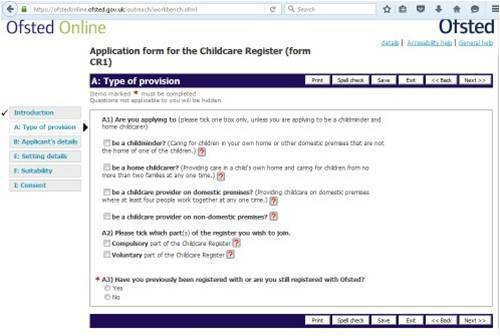 Once the ID form has been received an e-mail will be sent giving the DBS Application Reference which begins with the letter E.
Now the DBS Application can be tracked at https://secure.crbonline.gov.uk/enquiry/enquirySearch.do. The DBS Update Service (£13 yearly) can now be added. https://secure.crbonline.gov.uk/crsc/apply?execution=e1s1. 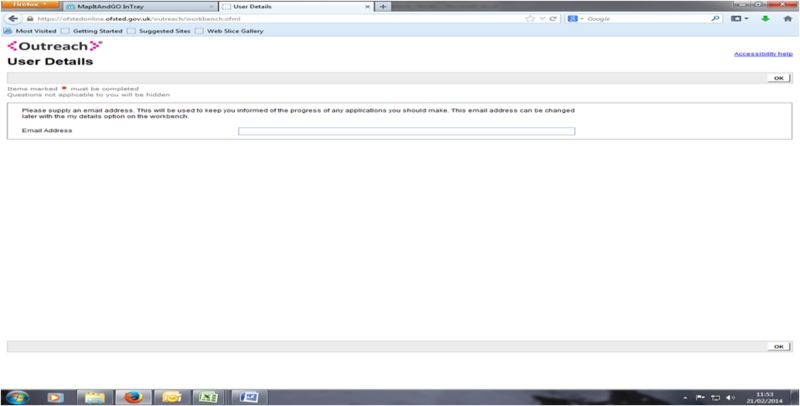 During the Update Service application process the system will show a Service ID. It is very important that your nanny writes this down and keeps it safe as it is used for logging in to the system in future. It can be useful to print a screen shot or save screen to PDF and then e-mail the PDF to your nanny. 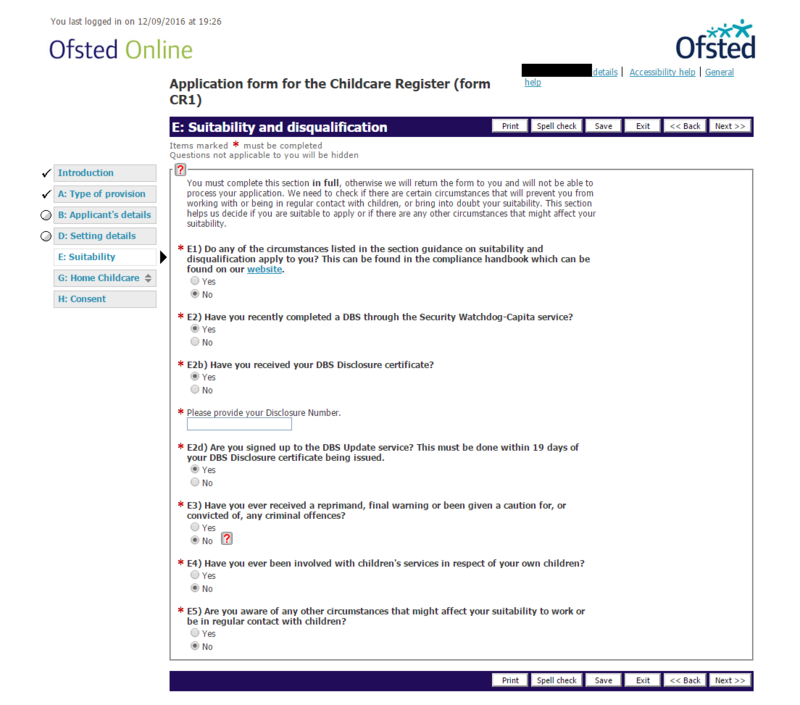 Once your nanny’s DBS Certificate arrives in the post, then proceed to completing the Ofsted registration form. As a working parent who employs a nanny there could be substantial savings to be made on your personal income if your nanny is Ofsted registered on the Voluntary part of the Childcare Register. Fill in your Name, Email Address, Confirm Email Address, Password and Confirm Password. Then click on Submit. Please read conditions of use. 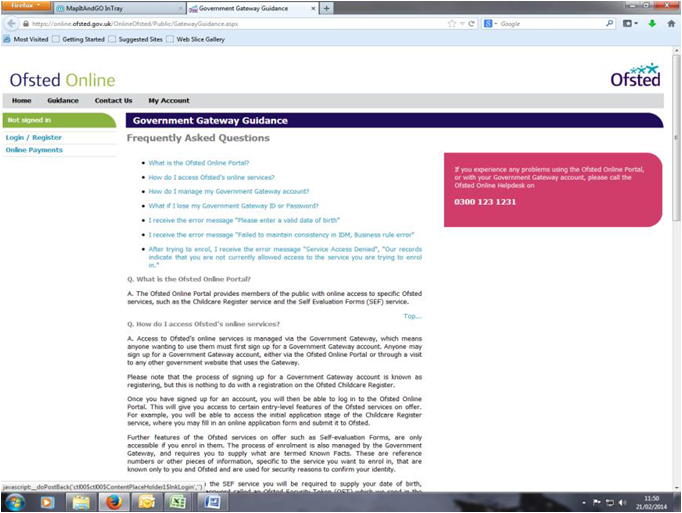 Click on box next to be a home child carer? Enter every address for the past 5 years. The dates must match with those used for their DBS application. If the address used for B10 is the same as your home address (such as for a live-in nanny) answer B11 as Yes, otherwise if address if different to your home, then answer No. Enter in Home and Mobile phone numbers. Click Next >> to change to next page. The setting address is your nanny’s place of work (normally your home address). Work through all the questions. D9 – Select the days your nanny will usually work. Weekday (All Day) would be typical. D10 – If your nanny works Term Time only then select that option, otherwise select All Year Round. D11 – Information is collected for local authority purposes. This question is currently not optional. Section E must be completed. 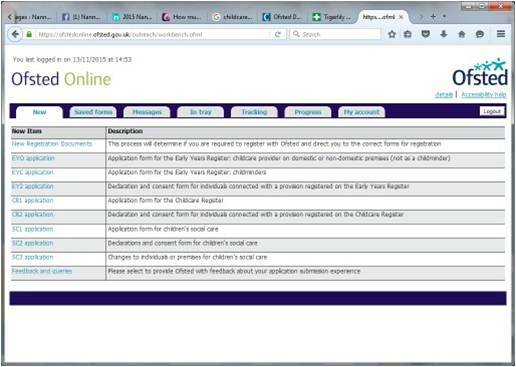 If your nanny has obtained a DBS disclosure via www.OfstedDBSApplication.co.uk then answer Yes for question E2b. 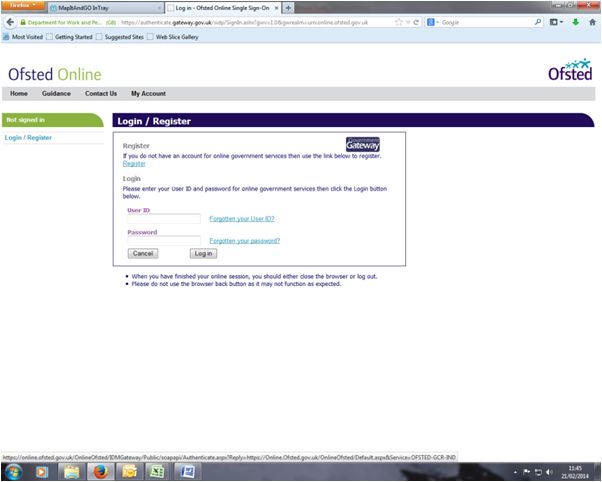 The form will then ask for the DBS Certificate Number. If the form does not accept the certificate number as printed then if the certificate number starts with two zeros then skip those zeros and enter the remaining digits. Section G is where you need to tick each statement to confirm that your nanny will comply with the requirements of the registration scheme. There are two pages of declarations. Paediatric First Aid training suitable for Ofsted registration. Nanny Insurance (this must be in the nanny’s name). Minimum of Level 2 training in childcare or training in the core skills as set out in the document 'common core of skills and knowledge for the children's workforce‘. Click Next>> to proceed through to Consent. 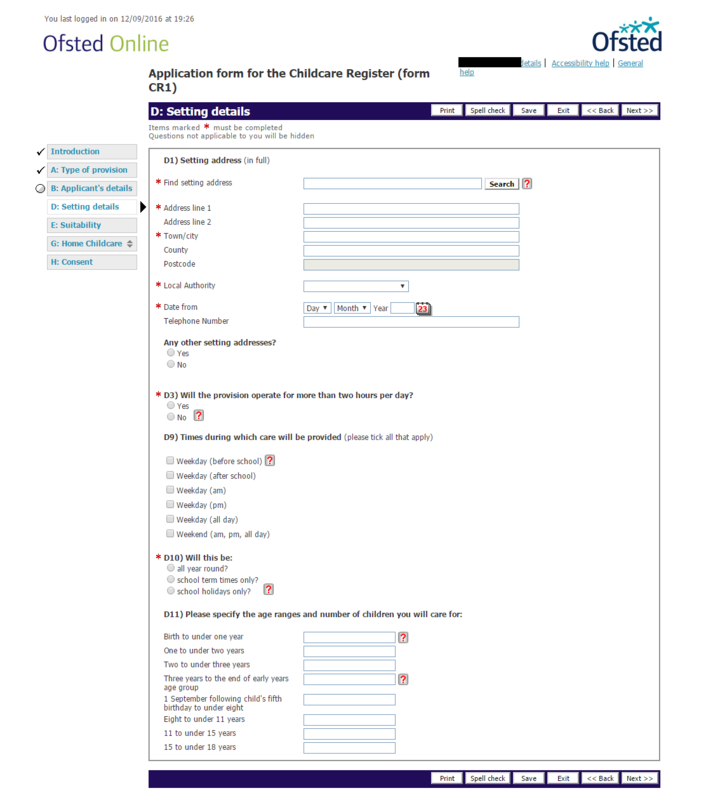 Click on H1 to agree to all the statement, sign (write your nanny’s full name /DOB) and click on Submit. 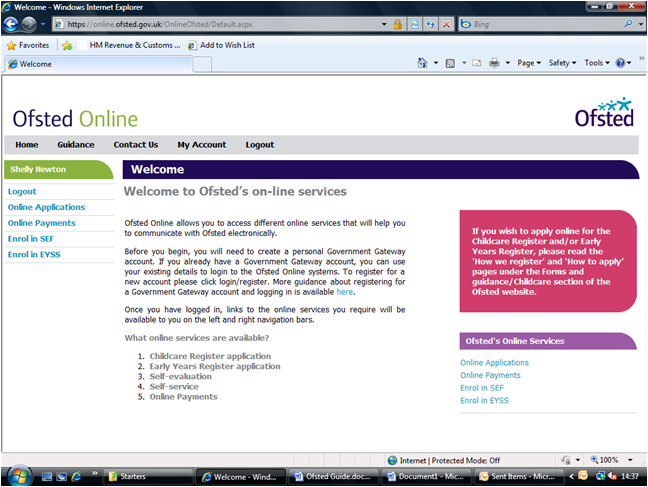 If Ofsted have any queries they will send an email to your nanny which tells them to check messages on the online system. When paying this invoice it can be useful to pay online and to keep a print/save to PDF of the payment confirmation screen, as some childcare voucher providers may require evidence of payment. 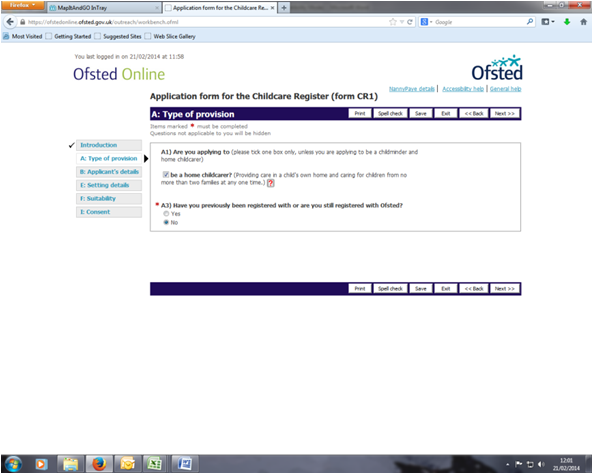 Ofsted may send your nanny a request for documents. This can often be a request for a COPY of their First Aid certificate. 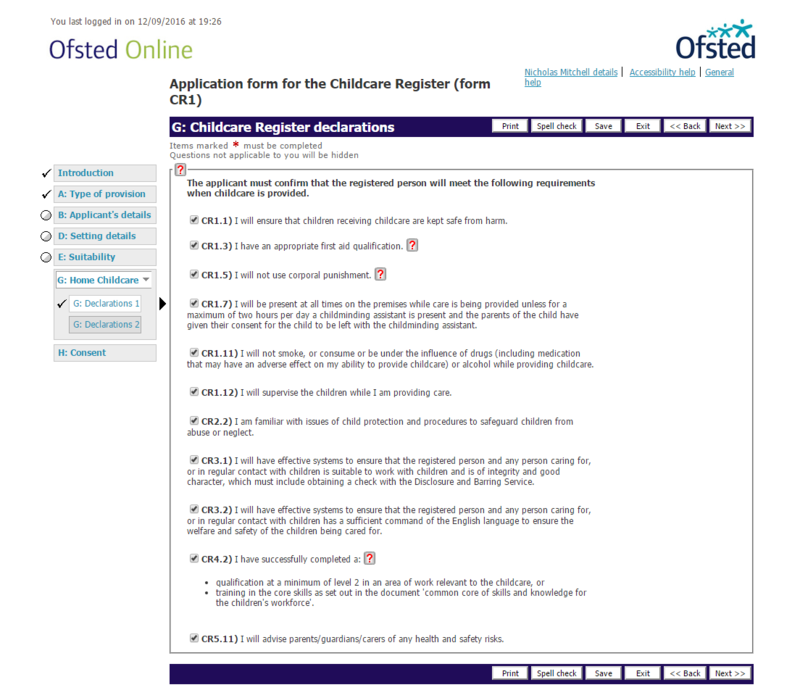 Your nanny is not registered until they have received their Ofsted Registration Certificate. Once they have that document (which must be kept safe) they can register with the Childcare Voucher company. 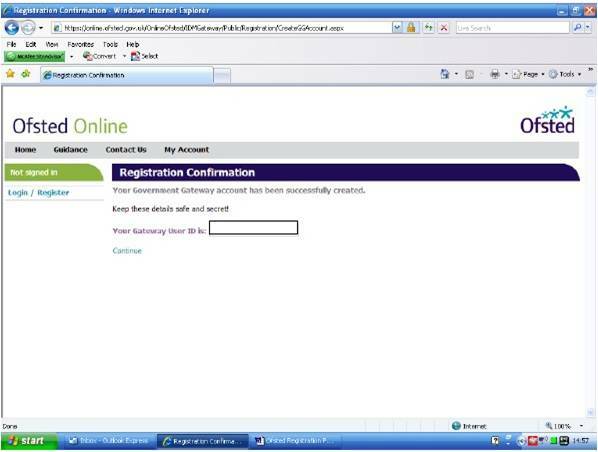 You will need to provide details of how to register or complete that registration on their behalf.